We’ve picked up a habit of paying for pasta dishes in Italian restaurants in town. There’s nothing wrong with the pasta dishes but there’s something wrong with paying €10 (or more!) for something you can make a vat of for far less than that. 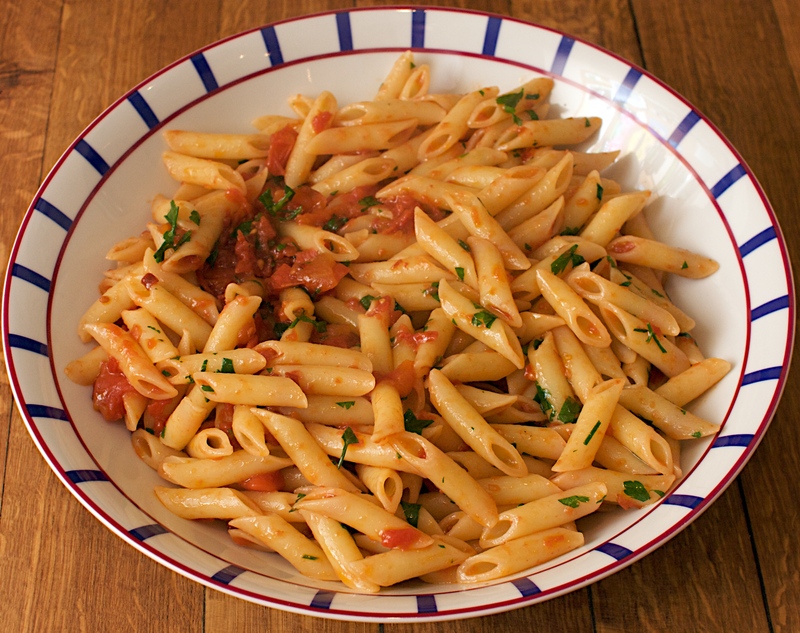 So we’ve resolved to cook our own pasta dishes from now on – starting with this Penne Arrabbiata from Silver Spoon Pasta. You will probably have most if not all the ingredients already which makes this practically free! Heat the oil in a frying pan, add the garlic and chilli and cook until the garlic turns brown. Remove the garlic cloves at this stage and throw them away. Add the tomatoes to the pan, season with salt and cook for about 15 minutes. Cook the penne in a large pan of salted boiling water until al dente, then drain and tip into the frying pan. Toss over a high heat for a few minutes, then transfer to a warm serving dish. Sprinkle with parsley and serve. (Original recipe from The Silver Spoon Pasta, Phaidon, 2009). Wine Suggestion: Italian wines tend to go with Italian foods as they are naturally high in acidity which makes them a perfect complement to tomato-based sauces. You don’t need to splash out for this dish. We had our favourite every-day wine Il Casolare, an IGT from Marche, which combines Sangiovese and Montepulciano. Interesting and food friendly but smooth and easy at the same time. On offer now in Mitchell & Son for €9.50 – bargain! Here here! We always regret if afterwards too! I don’t know, Jono and Jules, of course I could make it at home but we usually don’t go out because we’re hungry but because we want to be entertained and that’s why I would pay the $10 or whatever. When we’re hungry, I can handle it.